Engineers Remembered. As with just about any maritime disaster involving a great loss of life, it is the ship's Engineers who invariably leave most of their number behind. The Engineers aboard the Lusitania on that fateful Friday were no different. Like their famously stoic comrades aboard the Titanic before them, some 66 per cent of the Lusitania's Engineers did not survive the sinking. The ship's Chief Engineer, Archie Bryce, who was a close personal friend of Captain Turner, was one of those men. Gregg Bemis, pictured emerging from a Delta mini-sub following a dive to the Lusitania wreck in 1993. (Photo courtesy of Gregg Bemis). The Irish Navy patrols the wreck site to enforce the Heritage Order. One of two telegraphs from the stern docking bridge, on the seabed at a depth of 93 metres. Note a section of the stern safety rail above. (Leigh Bishop). Bollards located on the starboard side of the foredeck. They still have rope coiled around them. (Leigh Bishop). 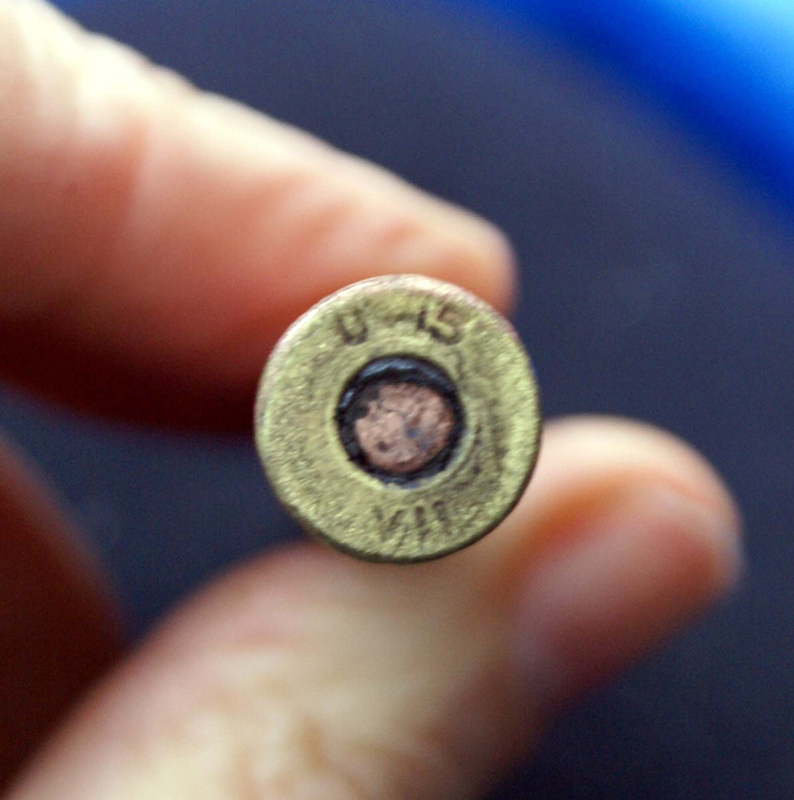 The serial number U-15 VII on the base of this .303 bullet shows that it was made for the British Government by Union Metallic Co. in 1915. The description is British Nickel Pointed. Full Metal Jacket. Copper primer head stamp. Image Copyright Eoin McGarry, by kind permission. Recovered .303 bullets. Part of a consignment of four million such bullets found in the ship's forward cargo hold. Image copyright Eoin McGarry, by kind permission. 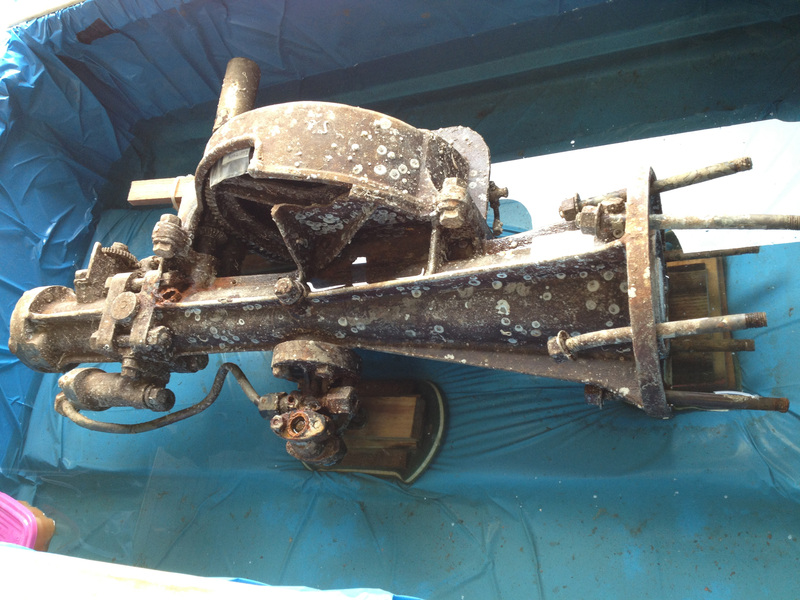 Recovered Bridge Telemotor. Image copyright Eoin McGarry, by kind permission. 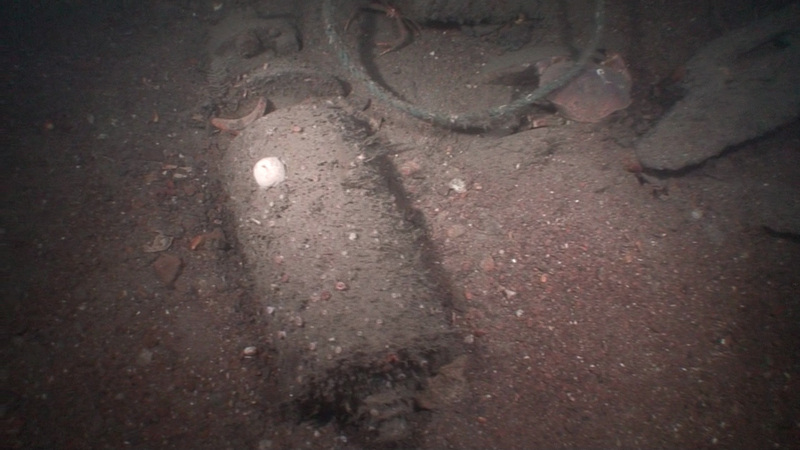 An unexploded WW2 Hedgehog depth charge lying in the wreck's debris field. This is one of many such charges that are scattered all around the ship. Proof that the Royal Navy used the wreck as target practice. Image copyright Eoin McGarry, by kind permission. One of the Bridge Telegraphs in situ on the wreck. Image copyright Eoin McGarry, by kind permission. One of the ship's triple chime whistles lying on the seabed. Image copyright Eoin McGarry, by kind permission. The seemingly indefatigable Greg Bemis continues his earnest quest for the final answer both on and off the wreck. The 2011 dives however revealed that after nearly a century on the bottom and after having been used for target practice, (there are still many unexploded “Hedgehog” depth charges scattered amongst the ship’s debris field), the wreck of the Lusitania is deteriorating at an alarming rate. The collapse of the hull has well and truly begun and its total collapse cannot now be far away. During the 2011 season’s dives, which were hampered by bad weather and some equipment problems, they were able to get a small ROV called Video-ray inside the forward hold, through a breach in the Port side of the hull caused by the wreck’s natural deterioration. 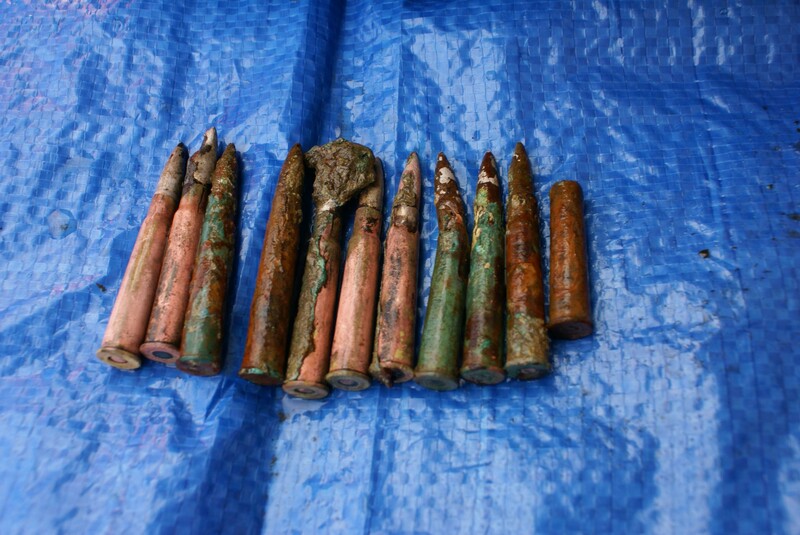 Penetrating about twenty feet into the devastated cargo hold, they found and filmed stacks and stacks of upturned copper ingot bars and huge quantities of .303 rifle ammunition, as well as evidence of severe damage that was not characteristic of the partial collapse of the wreck. However, the crucial area to be examined lies underneath that devastation, against the sea floor, buried under another twenty to thirty feet of heavy and probably very unstable wreckage. To get to it, all the debris on top would have to be moved, which given the wreck’s condition, could possibly cause the Port side hull plating to collapse on top of it all anyway. LUSITANIA REMEMBERED The volunteer crews of the Lifeboat Service have a long and proud history of saving lives at sea and Friday May 7th, 1915 was no exception. When the crew of the Courtmacsherry Lifeboat knew of the disaster that had overtaken the Lusitania, they did not hesitate to put to sea. The biggest problem facing those determined men was not bad weather or enemy intervention, but good weather. Their lifeboat was a sailing vessel. They had twelve miles to go to reach the scene of the disaster and there was no wind. So, they rowed! By the time they got there, other, steam-powered vessels were already on scene, but that did not prevent them from doing useful work. Ferrying survivors to other, faster vessels and retrieving bodies. After such a gruelling day's work, they were then faced with the same journey back. On each anniversary of the disaster, the Courtsmacsherry lifeboat still goes out to the scene of the sinking; to lay a commemorative wreath on the waves above the wreck. Not only to honour the victims of the tragedy, but also to remember the selfless devotion to duty and the sheer determination of their former colleagues, in the very best tradition of the Lifeboat Service. Lusitania propeller memorial at The Albert Dock Liverpool. Almost identical lifeboat to the one sent out to the Lusitania from Courtmacsherry. Photo; Dara Gannon, RNLI. Last survivor of the Lusitania disaster, Audrey Lawson-Johnson commissioning a new lifeboat in Newquay. This photo was taken a few years before Audrey passed away. She was a lifelong supporter of the RNLI. Photo: Dara Gannon RNLI/Lusitania Online. We received an email from Mr. David Sayle in the Isle of Man who states "Did you know that some of the Lusitania's lifeboats survived and were used as viking boats in Peel during 1970's and later. I personally along with others, rowed one of them (named sea dragon) from Peel in the Isle of Man to Strangford Loch in Ireland. It was done for charity in the international year of the child and a lot of funds were raised. Some of these lifeboats may still survive yet. My point being that even years later, Lusitania's lifeboats were still saving people, albeit in a different way.The year we rowed sea dragon to Ireland was 1983" The wreck of the ship is owned by an American businessman named F. Gregg Bemis Junior.Although Mr Bemis has proved his ownership in three separate courts,the Irish Office of Public Works have placed an Underwater Heritage Order upon the site occupied by Mr. Bemis' property. Any projected diving operations to the Lusitania therefore need to go through a complicated application procedure before permission to visit the wreck can be obtained. Click HERE for a link to a story about clues found in the Lusitania’s Sinking Details of previous diving expeditions to the wreck of the Lusitania can be found by visiting www.divernet.com. If you wish to see a video of a dive on the Lusitania click on the link www.shipwreckfilms.co.uk/page11.html Scroll down the page to where it says "Diving the Lusitania" and click on the movie camera icon next to those words. What you get is a four minute wmv film of the wreck. Charles Frohman/Lusitania Memorial in Marlow. Image Marlow Camera Club/Lusitania Online. Engineers Remembered. As with just about any maritime disaster involving a great loss of life, it is the ship's Engineers who invariably leave most of their number behind. The Engineers aboard the Lusitania on that fateful Friday were no different. Like their famously stoic comrades aboard the Titanic before them, some 66 per cent of the Lusitania's Engineers did not survive the sinking. The ship's Chief Engineer, Archie Bryce, who was a close personal friend of Captain Turner, was one of those men. Chart showing debris field co-ordinates. Click on image for larger version Google Map link HERE We received an email from Mr. David Sayle in the Isle of Man who states "Did you know that some of the Lusitania's lifeboats survived and were used as viking boats in Peel during 1970's and later. I personally along with others, rowed one of them (named sea dragon) from Peel in the Isle of Man to Strangford Loch in Ireland. It was done for charity in the international year of the child and a lot of funds were raised. Some of these lifeboats may still survive yet. My point being that even years later, Lusitania's lifeboats were still saving people, albeit in a different way.The year we rowed sea dragon to Ireland was 1983" The wreck of the ship is owned by an American businessman named F. Gregg Bemis Junior.Although Mr Bemis has proved his ownership in three separate courts,the Irish Office of Public Works have placed an Underwater Heritage Order upon the site occupied by Mr. Bemis' property. Any projected diving operations to the Lusitania therefore need to go through a complicated application procedure before permission to visit the wreck can be obtained. Click HERE for a link to a story about clues found in the Lusitania’s Sinking Details of previous diving expeditions to the wreck of the Lusitania can be found by visiting www.divernet.com. If you wish to see a video of a dive on the Lusitania click on the link www.shipwreckfilms.co.uk/page11.html Scroll down the page to where it says "Diving the Lusitania" and click on the movie camera icon next to those words. What you get is a four minute wmv film of the wreck. Gregg Bemis, pictured emerging from a Delta mini-sub following a dive to the Lusitania wreck in 1993. (Photo courtesy of Gregg Bemis). The Irish Navy patrols the wreck site to enforce the Heritage Order. One of two telegraphs from the stern docking bridge, on the seabed at a depth of 93 metres. Note a section of the stern safety rail above. (Leigh Bishop). Bollards located on the starboard side of the foredeck. They still have rope coiled around them. (Leigh Bishop). The serial number U-15 VII on the base of this .303 bullet shows that it was made for the British Government by Union Metallic Co. in 1915. The description is British Nickel Pointed. Full Metal Jacket. Copper primer head stamp. Image Copyright Eoin McGarry, by kind permission. Recovered .303 bullets. Part of a consignment of four million such bullets found in the ship's forward cargo hold. Image copyright Eoin McGarry, by kind permission. Recovered Bridge Telemotor. Image copyright Eoin McGarry, by kind permission. An unexploded WW2 Hedgehog depth charge lying in the wreck's debris field. This is one of many such charges that are scattered all around the ship. Proof that the Royal Navy used the wreck as target practice. Image copyright Eoin McGarry, by kind permission. 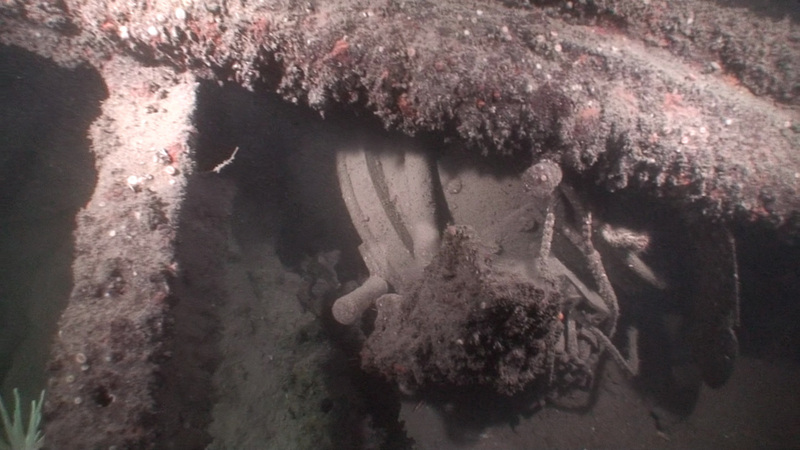 One of the Bridge Telegraphs in situ on the wreck. Image copyright Eoin McGarry, by kind permission. One of the ship's triple chime whistles lying on the seabed. Image copyright Eoin McGarry, by kind permission. The seemingly indefatigable Greg Bemis continues his earnest quest for the final answer both on and off the wreck. 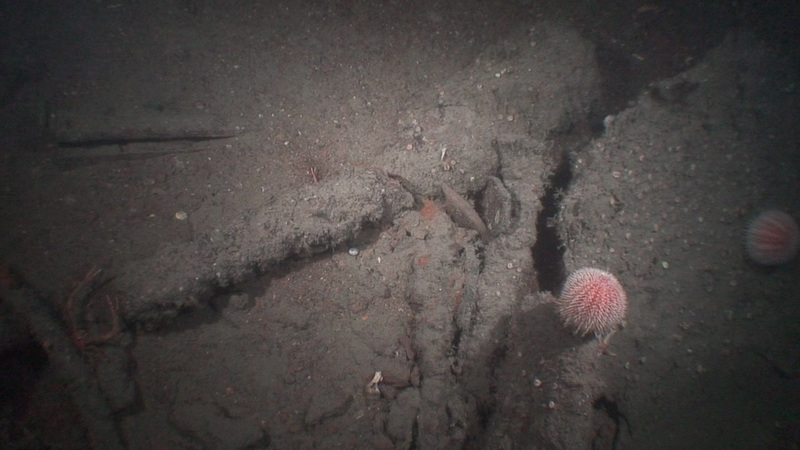 The 2011 dives however revealed that after nearly a century on the bottom and after having been used for target practice, (there are still many unexploded “Hedgehog” depth charges scattered amongst the ship’s debris field), the wreck of the Lusitania is deteriorating at an alarming rate. The collapse of the hull has well and truly begun and its total collapse cannot now be far away. During the 2011 season’s dives, which were hampered by bad weather and some equipment problems, they were able to get a small ROV called Video-ray inside the forward hold, through a breach in the Port side of the hull caused by the wreck’s natural deterioration. Penetrating about twenty feet into the devastated cargo hold, they found and filmed stacks and stacks of upturned copper ingot bars and huge quantities of .303 rifle ammunition, as well as evidence of severe damage that was not characteristic of the partial collapse of the wreck. However, the crucial area to be examined lies underneath that devastation, against the sea floor, buried under another twenty to thirty feet of heavy and probably very unstable wreckage. To get to it, all the debris on top would have to be moved, which given the wreck’s condition, could possibly cause the Port side hull plating to collapse on top of it all anyway. LUSITANIA REMEMBERED The volunteer crews of the Lifeboat Service have a long and proud history of saving lives at sea and Friday May 7th, 1915 was no exception. When the crew of the Courtmacsherry Lifeboat knew of the disaster that had overtaken the Lusitania, they did not hesitate to put to sea. The biggest problem facing those determined men was not bad weather or enemy intervention, but good weather. Their lifeboat was a sailing vessel. They had twelve miles to go to reach the scene of the disaster and there was no wind. So, they rowed! By the time they got there, other, steam-powered vessels were already on scene, but that did not prevent them from doing useful work. Ferrying survivors to other, faster vessels and retrieving bodies. After such a gruelling day's work, they were then faced with the same journey back. On each anniversary of the disaster, the Courtsmacsherry lifeboat still goes out to the scene of the sinking; to lay a commemorative wreath on the waves above the wreck. Not only to honour the victims of the tragedy, but also to remember the selfless devotion to duty and the sheer determination of their former colleagues, in the very best tradition of the Lifeboat Service. Lusitania propeller memorial at The Albert Dock Liverpool. Almost identical lifeboat to the one sent out to the Lusitania from Courtmacsherry. Photo; Dara Gannon, RNLI. Last survivor of the Lusitania disaster, Audrey Lawson-Johnson commissioning a new lifeboat in Newquay. This photo was taken a few years before Audrey passed away. She was a lifelong supporter of the RNLI. Photo: Dara Gannon RNLI/Lusitania Online. Charles Frohman/Lusitania Memorial in Marlow. Image Marlow Camera Club/ Lusitania Online.